I see a fair amount of roadkill while biking, all in various stages of going from dust to dust. By far the worst one is the skunk. The skunk, while alive, is an ignoble animal. Sure, the skunk is pretty with his soft dark fur, fluffy tail and snazzy racing stripe, resembling a dandified squirrel. But the fun part of skunks stops there. Get too close to one and you’ll be treated to an oily coating of a noxious liquid with a despicable lingering odor. Run one over with your car and the odor permeates the area, lingering for days, causing anyone driving by to flee, all the while gagging and moaning. So let me get this straight. Skunks live in homes that other industrious mammals built, sleep for weeks at a time, and have lots of babies. In other words, skunks are society’s welfare mammals. They produce nothing, do no work and smell bad to boot. Other disgusting animals at least have some valuable function in the circle of life. For instance, many people abhor bats, finding them to be creepy, yet their voracious appetites keep the annoying mosquito population at bay. (Of course if we got rid of the mosquitos, maybe we wouldn’t need the bats, but that’s another story) But skunks? “…Skunks are opportunistic eaters with a varied diet. They are nocturnal foragers who eat fruit and plants, insects, larvae, worms, eggs, reptiles, small mammals, and even fish. ” (National Geographic) Okay, so no noxious pest that the skunks make their mission in life to devour – just ordinary stuff that any mammal could eat. There’s nothing that skunks do, other than producing bad smells, that couldn’t be picked up by other mammals in the food chain. So is there any reason we really NEED skunks? Do they serve some purpose, perchance unseen, that enriches the world around us? Perhaps. Among the inner circle of the animal kingdom, skunks serve as a cautionary tale, the bad example of mammal evolution gone awry. Picture this. Mother Beaver gathers her young ones close and says, in beaver speak, of course “Beaverettes, work hard on your little dams, or you’ll grow up to be just like those skunks – lazy, indifferent, lacking ambition, and smelling bad.” The little beavers scurry away, putting their beaver noses to the beaver grindstone, fearing the fate of becoming like…the skunk. So, maybe we do need skunks, or at least our furry friends do, to parade as bad examples to their children. But do we humans need skunks? Nah, we’ve already got plenty of bad examples around already. This entry was posted in Personal Rants, Satire Friday and tagged Humor, mammals, nature, postaweek2011, satire, skunks by Huffygirl. Bookmark the permalink. Thanks. In case you get there first, maybe you’ll rid the world of skunks just for me. I’m with you on the snakes – I really don’t think we need them either. Snakes were plentiful on our property when I was growing up, and I always worried that one would drop on top of me out of a tree. Can you add cicadas to your list, too? Though I love their sound, I don’t think I’ve ever seen a more clueless bug. Lol you’re so funny:) thanks for the laugh! our dog chased down a skunk before we could stop her. Sprayed right in the face/snout. kept sneezing and wiping it’s paw on her face, rubbing her face in the dirt. No one could stand being around her because it was horrid. We read to use tomatoe paste to help reduce the smell. So poor dog was then subjected to smearing of something else on her. It helped a bit. Wow, that was like 15 years ago, and I can still picture her chasing the skunk. **Down 10lbs in 2 weeks- wahoo! See Sandi, we really don’t need skunks. Nothing but trouble. BTW, good to hear from you again. And 10 # in 2 weeks – how is that possible? 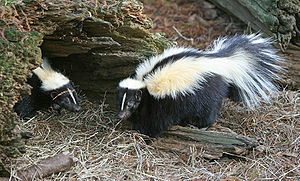 Skunks allow us the measure for comparison between good smells and bad. Without skunks we won’t need perfumeries and we would never have known Pepé Le Pew! Interesting. Do we need the skunk to make us appreciate good smells? Discuss. “In other words, skunks are society’s welfare mammals.” What a good comparison to some members of our own society. I’m with you on skunks. How about flies? I would love to sit outside in my little courtyard and have a meal without being driven inside because of flies. At least they don’t smell bad. This was very funny, HG. So far we’ve got skunks, snakes, and cicadas on the list, so why not add flies? In many ways they’re worse than skunks, because they’re everywhere. At least they don’t smell bad – they just carry pestilance! Skunks behave like they all should! How cute! Isn’t there another song similiar to that about …God? If Ben thinks that skunks are great, perhaps he’s never smelled the smell they leave behind. We’ve seen an increase of skunks in our local canyons, which I’m sure is about to followed by an increase in coyotes. It sort of works out that way. So are the coyotes eating the skunks? I can’t believe that skunk would be good to eat, unless they spit out the smelly glands maybe! We hear the coyotes all the time. A lot of times you’ll hear “yip yip yip yip” then “SCREEEEEEEE” from some about to be ex-varmint. On our chaparral walks we find a lot of skins of things. Mostly bunnies, but I’ll be curious to see if skunks start to show. I’m actually somewhat partial to bunnies because they’re so cute, so I’d definitely root for the coyotes to be taking out the skunks. Really, not one person has mentioned anything of value that they contribute to the animal kingdom. No Lot-like person has come forth to speak on the unknown virtues of skunks. What a great poem, and surprisingly, the second ode I’ve received on skunks. With your permission, I’d like to feature this in a follow-up post. Thank you. We’ve posted it on our blog as well but would love for you to feature it on a follow-up post. I’ll check it out on your blog. Do you want me to credit your blog site, or Sara Sultan? Okay, will do. It will probably be up in the next few days. Where would we be without Pepé Le Pew? There you go, something good about Skunks – a humorous cartoon character 😉 By the way, stay clear of Seabirds in general and burrowing Penguin species in particular – they spray interlopers with very fishy excrement! Oh, sounds awful,I will. Not sure if I’ll ever run into any kind of penguin around here, although we did see some in Hawaii. They are Cute Little Critters. ClydeManMuffin, The Dog, The Main Dog, apparently likes them. He’s been sprayed three times in a year😔 But I hear the Skunk likes Mice so as long as she and her two Babies stay at the back 40, and as long as we don’t see them during the day, I choose to leave them be.